There’s no way around it – police departments have a lot of firearms to store, which means they need a lot of options for different situations. At StoreMoreStore we have a variety of firearm storage solutions for temporary weapon storage and long-term evidence storage that will keep guns safe, secure, organized, and easily accessible. 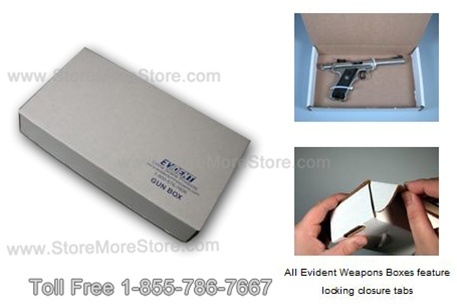 Our handgun storage boxes are made for safe secu re storage and transit. They are constructed from heavy-duty white corrugated cardboard and feature locking tabs that keep the lid securely closed. You can label the edge of the handgun storage box for quick identification and retrieval. Keeping handgun evidence in boxes limits the amount of contact people will have with the firearm to maintain its integrity. Also, the boxes make storing handguns long-term easier since everything is uniform in size and will fit nicely on your shelving. These storage boxes are just like the above handgun style except they are specifically designed for long guns like rifles. 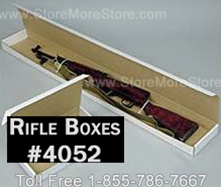 An advantage to using boxes for storing long guns includes better preservation of biological evidence. Surfaces may have latent fingerprints while a checkered stock may contain epithelial cells. There is also the possibility that the long gun may have other types of bodily fluids. And all of this DNA evidence will be better preserved if kept in a container, such as the long gun storage box. Wall-mounted gun cabinets are the ideal solution for temporary handgun storage. The cabinets can be used in a variety of environments from interview rooms, common areas, courthouses, or any other place that requires the utmost in handgun security. All of our wall-mounted gun cabinets are designed for durability and rigidity to provide the highest level of security for your stored weapons. And while the outside is tough, the inside is lined with neoprene to protect stored guns from damage. Also, depending on which type of gun cabinet, there are both keyed and combination locks available. Most police officers keep their long guns mounted beside them in their vehicles, which can be uncomfortable since the guns are bulky and take up a lot of space. Another problem is that weapons stored in plain sight makes them attractive to thieves. The police vehicle weapon safes store all types of guns safely and securely in the trunk of your car or SUV. Access is easy with just the push of a button, yet long guns remain secure with a tamper-resistant lock. These are just a few of our solutions specifically designed for firearm storage. Check out all of our police department storage solutions on our website. And if you can’t find what you’re looking for or need assistance, please give us a call at 1-855-786-7667. We have several firearm cabinets that you can customize to your space and needs, however,our 13 Compartment Handgun, Rifle and Long Gun Locker is a great base unit that will allow you to increase inventory space while maintaining a safe and secure weapon storage. 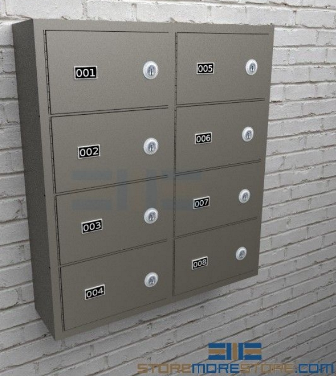 Whether you are a gun owner or police chief, these firearm lockers are designed and developed to provide the most quality and secure storage of handguns, rifles, shotguns, ammunition, etc. Space– Thirteen compartments with five for long guns of about 42’’ and the rest for short weapons of up to 14’’. The cabinet is 12’’ deep with a full sized door. Durability– The cabinet has a welded 18 gauge steel construction door. Also, the shelves are lined with 1/8″ neoprene. An extra heavy duty hinge on the gun locker’s main door gives it the strength and durability you need. 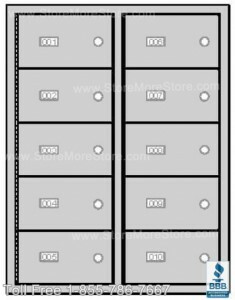 Security– Each weapon rack compartment has an individual combination or unique key lock along with one master lock for the whole storage cabinet. The product is available in also 13 different colors. 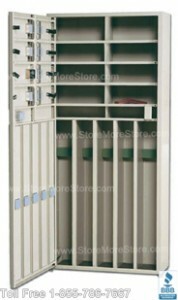 With the convenience of shopping online, you can get the best deal on this firearm storage cabinet at StoreMoreStore.com. Not only that you will get the best prices and quality, you will also get other benefits including FREE SHIPPING! The product itself has lifetime warranty on the frame and a five year limited warranty on the moving parts. Check out this weapon rack as well as our other firearm cabinets HERE at StoreMoreStore!